The cranial nerves are an important collection of nerves, all of which travel directly to the brain rather than through the spinal cord, like most other nerves. They are called cranial nerves because they originate and are located inside your cranium, or skull. The cranial nerves have several functions critical for day-to-day life, so they are an important focus for physicians as well as patients affected by disorders of cranial nerve function. Unless you're a medical professional, it's not usually necessary to know all the details about each individual nerve. However, having an understanding of the cranial nerves can help you discover the source of particular problems you've been having. This can guide you towards more information and proper medical care. The cranial nerves are all located on the underside of your brain inside your skull. They come in pairs, one on each side of the brain, and are numbered in Roman numerals I through XII. These are often labeled as CN I, CN II, and so on. The first two cranial nerves, the olfactory nerve and the optic nerve, arise from the cerebrum, and the remaining ten nerves originate in the brain stem. The nerves then travel from their origin to various body parts in your head, face, mouth, and--in some cases--in the periphery of the body. Some professionals recognize an extra cranial nerve called the terminal nerve, or cranial nerve zero. This nerve is a small, often microscopic, plexus of nerves near the olfactory nerve. Originally thought to support the function of smell, it is now known that the terminal nerve does not enter the olfactory bulb and does not function in smelling things. Rather, it is thought that this nerve may be a vestigial anatomical structure, and it may play a role in regulating sexual function. Cranial nerves function to relay various types of information to and from the body. Some of the nerves are motor nerves, and they move muscles. Others are sensory nerves; they carry information from the body to the brain. Some cranial nerves are a combination of motor and sensory nerves. Each pair of cranial nerves serves a specific purpose in your body, and function as either a motor nerve, sensory nerve, or both. Various conditions can affect the nerves, and specific signs and symptoms may arise in your body as the result of an injury or problem to a cranial nerve. The olfactory nerve is responsible for transmitting everything we smell to the brain. This nerve travels from the cerebrum to the olfactory bulb, where smells are analyzed. Disruptions to this nerve can cause anosmia, an inability to detect scents. This also dramatically impacts our sense of taste. The optic nerve transmits electrical signals from the retina of your eye to the brain, which transforms these signals into an image of what we see in the world around us. Disorders of the optic nerve, such as optic neuritis, can lead to visual disturbances, double vision, and blindness. The oculomotor nerve has two main functions. First, the oculomotor nerve transmits signals that allow the eyes to move in every direction not controlled by other cranial nerves. Second, the oculomotor nerve carries parasympathetic fibers to the iris, causing the iris to constrict when you're in bright light. A lesion in the oculomotor nerve can cause not only double vision (diplopia), but can also cause a "blown pupil"—a pupil that cannot constrict. Due to its location, the oculomotor nerve is susceptible to damage by elevated intracranial pressure, and a blown pupil can be a sign of serious neurological trouble. The trochlear nerve controls a muscle that moves the eyeball down and out. A lesion of this nerve can cause diplopia, which can be improved by tilting the head away from the affected eye. The trigeminal nerve is primarily a sensory nerve, meaning that it relays sensation from the face to the brain. In addition, the trigeminal nerve controls some facial muscles important for chewing. One of the worst complications of trouble with the trigeminal nerve is trigeminal neuralgia, an extreme form of facial pain. This may be caused by a virus or by mechanical irritation due to rubbing by a bundle of blood vessels near the nerve. This nerve controls the muscle that moves the eye away from the nose. A lesion of the abducens nerve causes double vision, in which one image is directly next to the other. Sometimes the abducens nerve can be impacted on both sides in cases of increased intracranial pressure, such as pseudotumor cerebri. The facial nerve is complicated. Not only does it control most muscles of the face; this nerve also transmits taste signals from the front of the tongue, conveys parasympathetic fibers that make the eyes tear and mouth salivate, and is responsible for a little bit of sensation around the ear. It also helps modulate hearing through control of the stapedius muscle. This is why inflammation of the facial nerve, such as in Bell's palsy, can lead to more problems than just facial weakness, though such weakness is usually the most obvious symptom. This nerve has two main components: the cochlear component relays acoustic information to the brain so that we can hear, and the vestibular portion sends signals regarding balance and movement. Problems with the vestibulocochlear nerve can cause either hearing loss or vertigo, and often cause both. A common problem involving cranial nerve VIII is an acoustic neuroma. This benign tumor can press against the nerve, leading to hearing loss or dizziness. The glossopharyngeal nerve has a bunch of odd jobs. This nerve is responsible for taste from the back of the tongue, the sensation from a small portion of the ear and parts of the tongue and throat, the innervation of one muscle important for swallowing (the stylopharyngeus), and salivation by the parotid gland. It also receives important information about blood pressure from chemoreceptors and baroreceptors in the carotid body. Irritation of the glossopharyngeal nerve can lead to glossopharyngeal neuralgia, a condition in which it is very painful to swallow. This nerve controls the pharynx (for swallowing) and larynx (for speaking), as well as sensation from the pharynx, part of the meninges and a small portion of the ear. Like the glossopharyngeal nerve, the vagus nerve detects taste (from the throat) and also detects special signals from chemo and baroreceptors near the heart (in the aortic arch). Furthermore, the vagus nerve relays parasympathetic fibers to the heart, the signals from which can slow the heart's beating. 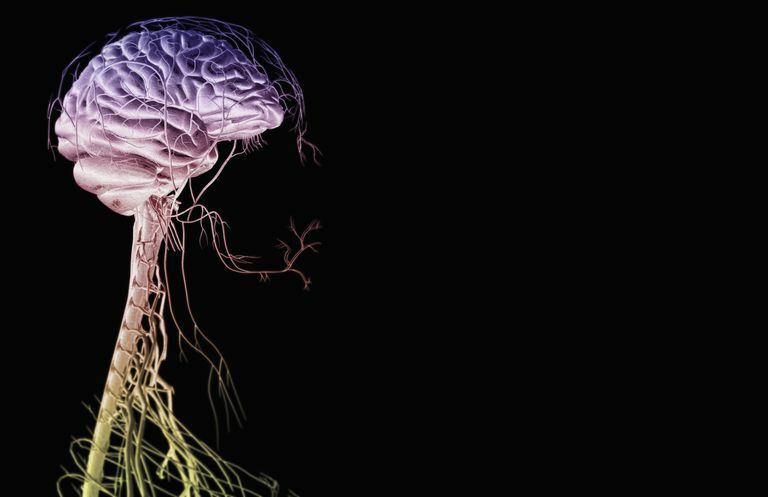 Because of its relationship to the heart, disorders of the vagus nerve could be very dangerous. On the other hand, stimulation of the vagus nerve has been shown to be potentially useful in a wide array of disorders, including epilepsy. The spinal accessory nerve is less complicated than its immediate predecessors. It only has one main function: to cause the contraction of the sternocleidomastoid muscle and the trapezius in order to help move the head or shoulder. Disorders of this nerve diminish the ability to use these muscles. The simple test for spinal accessory nerve function is to simply shrug your shoulders. If you cannot lift one shoulder, that spinal accessory nerve may be impaired. The hypoglossal nerve is a motor nerve that controls all the movements of the tongue. Difficulty speaking (dysarthria) or moving food in your mouth are potential consequences of a damaged hypoglossal nerve. If you have a problem or suspect a problem with a cranial nerve, you must see your doctor right away. Since there nerves are within the cranium, treatment often involves focusing on protecting your brain while helping to fix the impairment with the nerve. Some treatments for cranial nerve problems involve surgery. Of course, this is risky and should be used as a last resort. Some cranial nerve problems, like tumors, may be successfully treated with radiation. The focused beam of radiation can help to shrink or eliminate a tumor that is affecting the cranial nerve. Bottom line: if you are having any symptoms with movement or sensation around your head and face, you need to seek medical attention immediately. By getting an early diagnosis and starting the right treatment, you can increase your chances of a full recovery from a cranial nerve problem. Hal Blumenfeld, Neuroanatomy through Clinical Cases. Sunderland: Sinauer Associates Publishers 2002. Ropper AH, Samuels MA. Adams and Victor's Principles of Neurology, 9th ed: The McGraw-Hill Companies, Inc., 2009. McCabe MP, O'Connor EJ. What Are Olfactory Disorders and What Causes Them? What Is the Excruciating Facial Pain Disorder Trigeminal Neuralgia?